As the end of 2016 quickly approaches, we’d like to take a little time to note the many beautiful, practical, and carefully designed new house plans that have been added to our website over the past year. They vary in architectural style and size and deliver a vast array of special features from finished basements and outdoor kitchens to luxurious master suites and relaxing covered porches. With so many specially designed house plans to choose from, selecting the right house plan for your needs, preferences, lifestyle and tastes becomes an exciting adventure! Take some time to review this sampling of new house plans, you might just find the one you’re looking for! 037H-0251 – This sophisticated Mediterranean house plan was designed for coastal living with all the main living areas raised one level and the parking areas situated below them. Elegance abounds inside this home with plentiful decorative ceiling treatments, a combination of curved and angled walls, and countless luxurious amenities. Don’t miss the oversized island and huge pantry highlighting the gourmet kitchen. Pay attention to the glass sliders that open from the family room to the covered lanai and outdoor kitchen creating an impressive entertainment space. The master suite is sure to pamper with a morning bar, sitting room, lavish bath and dual walk-in closets. Other special features include a study, guest apartment, library and second floor lanai. This Mediterranean house plan is the epitome of luxury living! 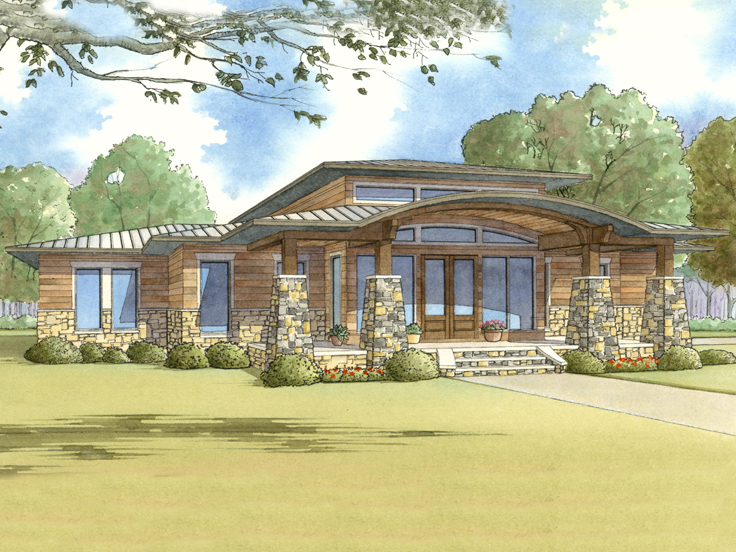 075H-0004 – Take a look at this new unique ranch house plan! It features a modern design with a Craftsman-style twist that is sure to get the attention of passers-by! A covered front porch welcomes all, and a double door entry quickly introduces the great room. Beyond, the kitchen and dining area overlook the rear covered porch providing an ideal arrangement for dining outdoors with dinner guests. Also, you’ll appreciate the snack bar, making it easy to have a quick meal on the go or a snack with the kids. Three bedrooms and two and a half baths accommodate the family’s needs. A two-car garage and generously-sized laundry room complete this family home plan. 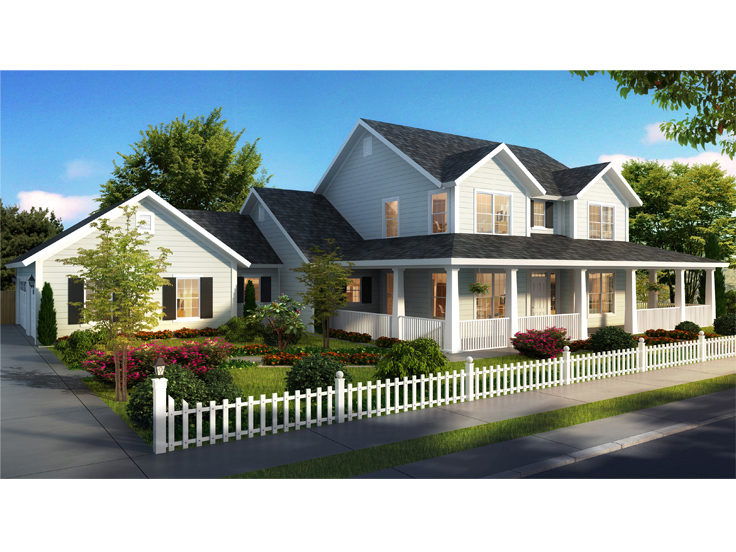 073H-0059 – If you like the idea of relaxed living and it’s time to step up from your starter home, this Southern house plan may be right for you. It features four bedrooms, four and a half baths, a two-car garage and 3540 square feet of living space. The covered front and rear porches offer an inviting place to relax outdoors and sip lemonade while you watch the kids play in the yard. Inside, the spacious family room delivers a great place to relax with kids and enjoy popcorn and a movie. Casual and formal dining spaces make it easy to entertain or grab a quick breakfast before you start your day. You’ll appreciate the main floor master bedroom outfitted with His and Her baths and walk-in closets. Three family bedrooms are positioned upstairs along with a game room and bonus space. 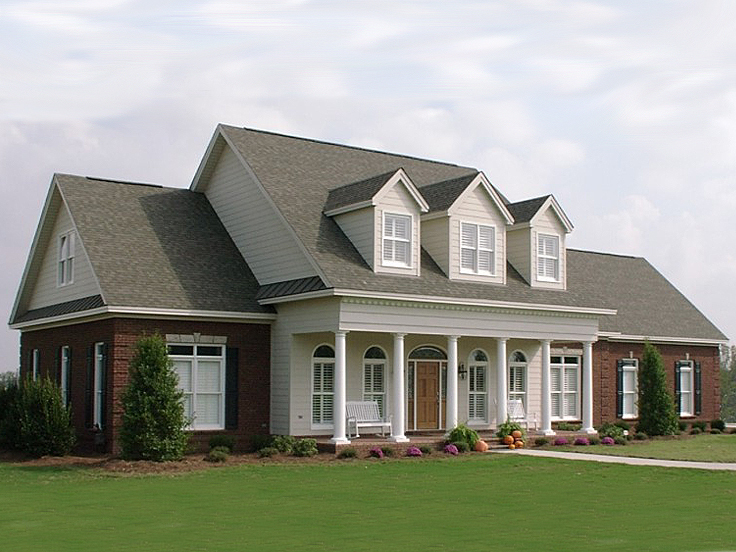 If you need to accommodate a larger of growing family, you can’t go wrong with this two-story Southern house plan. 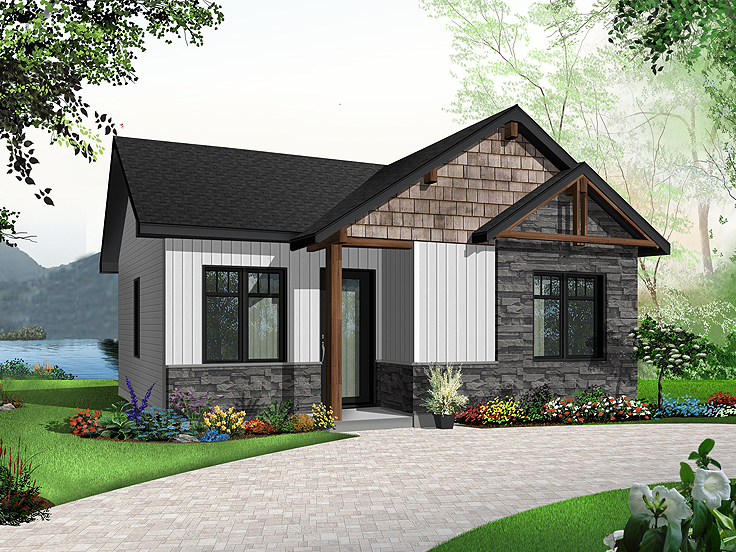 027H-0462 – Here’s a charming tiny house plan designed for comfort and efficient use of space. It’s compact floor plan makes it just right for those who a looking to down-size. It is also suitable for a vacation home or mother-in-law cottage. The floor plan features a minimalist approach without sacrificing all the comforts of a larger home. An open floor plan combines the living area with the kitchen delivering a sense of spaciousness. Two comfortably-sized bedrooms share a full bath complete with soaking tub. A utility closet holds a stackable washer/dryer unit. If you’re looking for efficient living, this tiny house plan delivers! 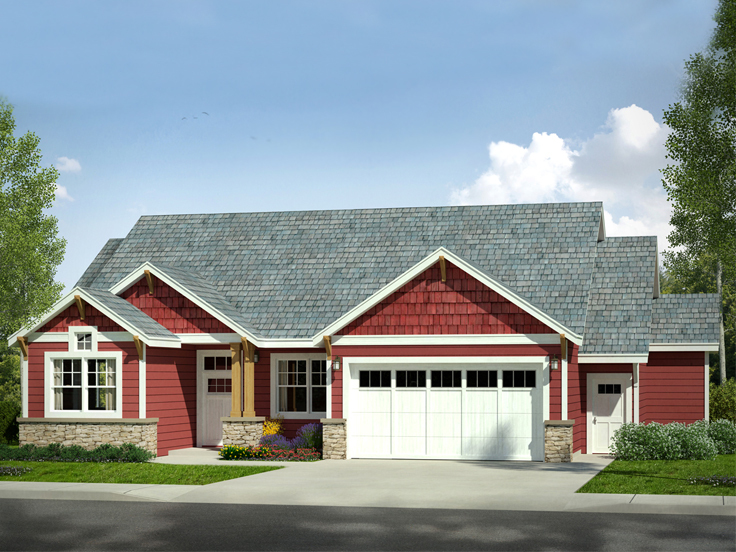 051H-0249 – This striking house Craftsman house plan delivers family living all on one level! An open floor plan promotes family time well-spent and keeps the cook involved in conversation while meals are prepared. The kitchen delivers a pantry and eating bar as it overlooks the dining area and vaulted living room. The two-car garage with storage area and the easy-to-access laundry room keep things neat and tidy. Three bedrooms are arranged on the left side of the home where two family bedrooms share a full bath, and the owner’s suite features a vaulted ceiling, private bath and walk-in closet. The second floor bonus room is waiting for your creative touch! It would be ideal for a game or hobby room, or it can be left unfished and used as storage if you prefer. Designed for family living one-story Craftsman house plan has more to offer than you might expect! 059H-0206 – Has your family outgrown your starter home? This two-story country house plan is just right for a growing family! Beyond the welcoming wrap-around front porch, you’ll find a comfortable and accommodating house plan that will flex and grow with your family’s changing needs and lifestyle. Just off the foyer, the study offers a peaceful home office, but it could easily be finished as an extra bedroom if necessary or maybe you prefer to furnish it with a sofa sleeper for the occasional weekend guest. The kitchen is strategically positioned between the breakfast nook and dining room serving both with equal ease no matter the occasion. A 12’ ceiling tops the hearth-warmed living room adding a sense of spaciousness. Your secluded master bedroom delivers a relaxing retreat at the end of the day with where you’ll find a soothing soaking tub. Upstairs, two bedrooms enjoy private bath access and walk-in closets. The option bonus room can be finished now or in the future to satisfy your family’s needs. 069H-0027 – This modern house plan is sure to catch your eye! Clean lines, extensive use of glass and modern materials give this two-story design exquisite curb appeal. Inside you’ll find an open floor plan with glass sliders opening from the great room to the lanai and outdoor kitchen. A two-story ceiling tops the great room and foyer delivering a dramatic feel. The unique kitchen is sure to please the family chef. Your master suit offers access to the lanai and features a luxurious and refreshing bath. Don’t miss the pool bath! It is just right for entertaining guests outdoors. On the second floor, the loft overlooks the great room and connects with two more bedrooms and the study. 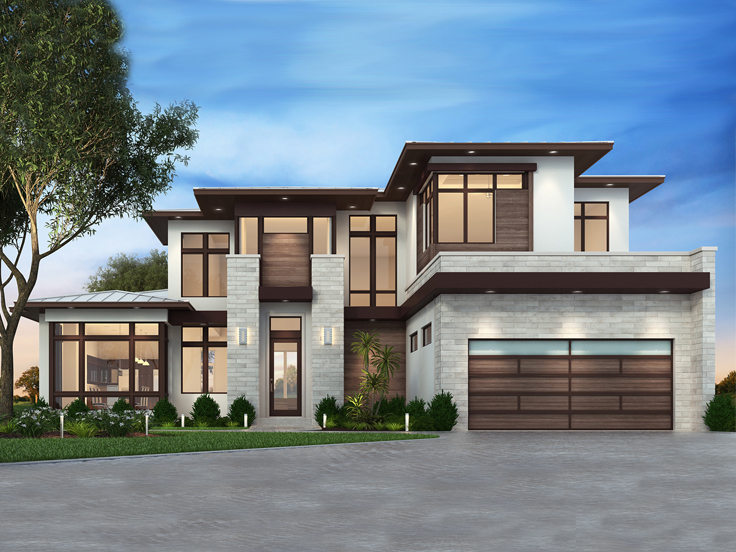 Elegant and spacious, this modern house plan is sure to please you! While these are just a few of the new house plans offered in 2016, you can search our entire collection of house plans for a design that includes the features and elements you prefer by using our Advanced Search tool.